We love specialized stores at Rehash — especially when those stores specialize in food! That made working with our fellow Oklahomies, Jerky.com, a no-brainer. They do one thing: jerky. They have enough flavors and meats to make your head spin (and we’re determined to try them all). 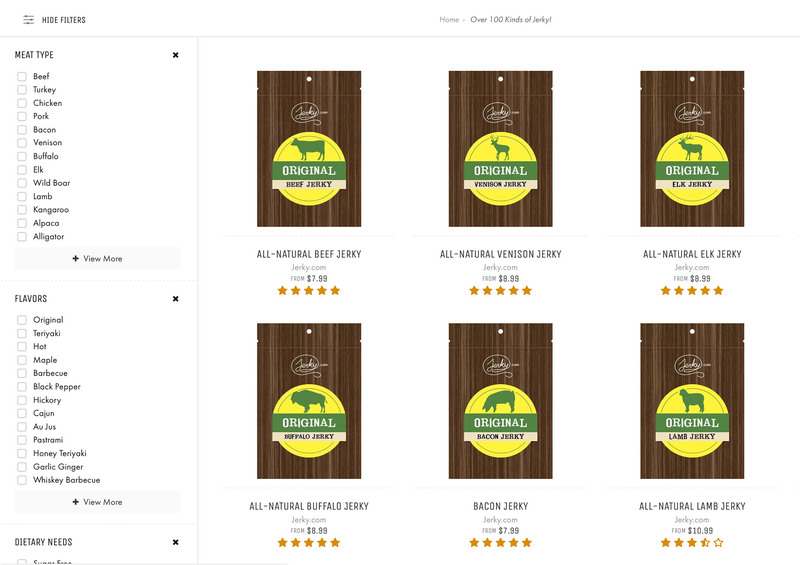 With all those delicious jerky options, customers needed a way to filter down exactly what they were looking for. Our Rebase theme’s faceted filtering allows Jerky.com customers to narrow down exactly what they want by applying filters. Products were created two different ways: As meat types with flavor variants, or meat/flavor combinations as individual products. We obviously didn’t want both showing on the same page, so we helped set up rules for when each was shown. If the customer navigated by meat type in the navigation, they only saw the product with flavor variants. If they filtered by a flavor, they saw each individual product made in that flavor. That way customers can shop whichever way makes the most sense to them. Jerky.com’s Jerky of the Month is exactly what it sounds like; they ship different delicious jerky products straight to your mouth doorstep every month. By default, they do so at the beginning of the month, but wanted a way for people to buy Jerky of the Month as a gift and start their subscriptions later. 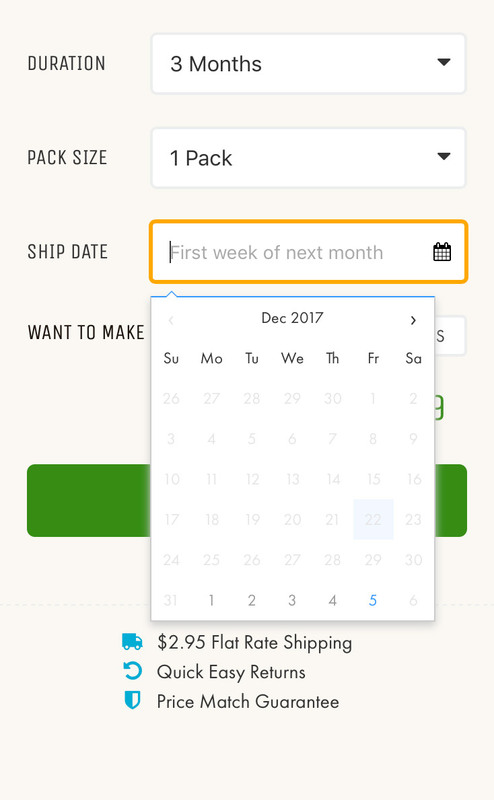 We added the ability to choose a subscription duration and start date so no one’s Christmas gift surprise got accidentally ruined. 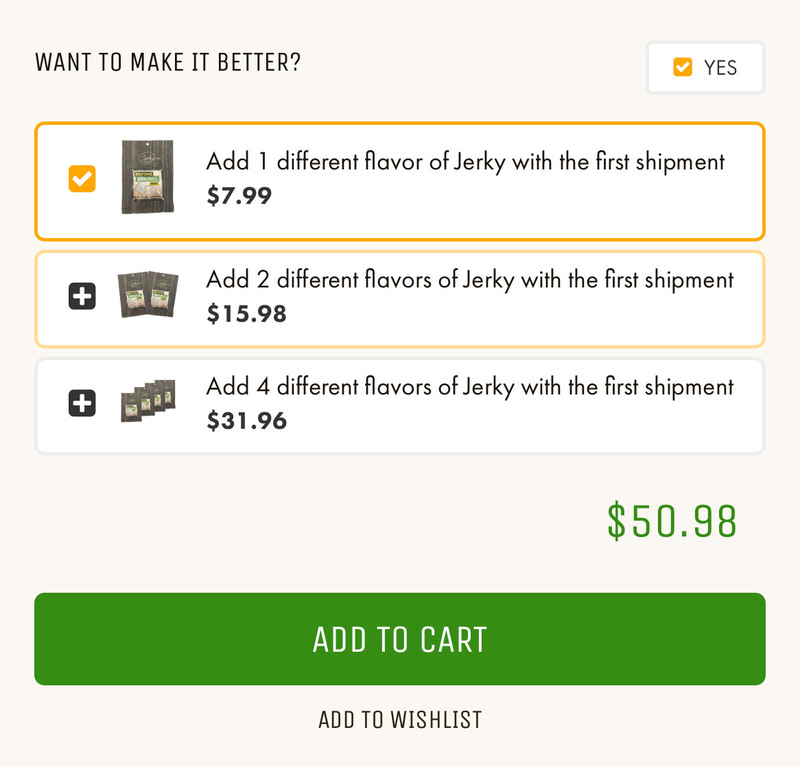 Jerky.com’s flat rate shipping is already encouraging customers to buy more product, but we specifically added a Make It Better section on product pages to encourage customers to add shop-specified products easily.